This compilation of four condensed novels contains a version of Tony Hillerman's The Ghostway. It also contains condensed novels by Mark Salzman, Rudolph Chelminski, and Roger Kahn. It was published by TSR/Harlequin Enterprises in 1987. This book does not have a dust jacket. The covers are dark brown. 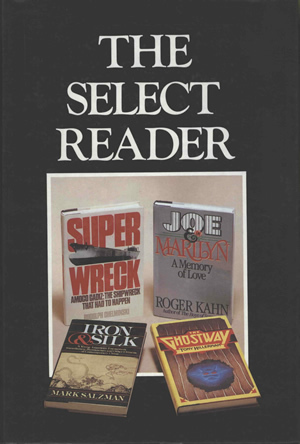 The front cover displays "THE SELECT READER" in white, above thumbnail photographs of the four novels condensed within the volume. The same text appears on the spine above the titles and authors' names, with the TSR logo at the bottom of the spine. The back cover is solid dark brown with no printing.